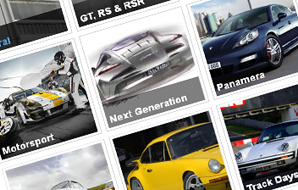 Porsche Folio "Articles & Guides"
Which Porsche 911 Should you Buy? So having decided you'd quite like to own a Porsche and you've narrowed it down to the flagship 911, which one do you ultimately buy. The 911 has been with us for many years. Having first been launched in 1964, the Porsche 911 has evolved. There has not been any revolution in design in any one model year. Rather the 911 has been improved and honed over the years, thus perfecting it's design and performance. While the Porsche 911 of today has many technological advances over it's forebears, you can still see the shape that is a "911" clearly defined. The 911 has gone from the type 911 through the type 964, 993, 996, the 997 and now the 951. Within each of those there are many variants. In the early years there were 2.2, 2.4, 2.7, 3.0 and 3.2 litre engines. Carerra, SC, S, Turbo, Cabrio, Targa, RS, RSR and so one. Well, to answer that question, we need to go back to basics. You will need to take into account, purchase price, resale price, cost of ownership, intended use of your 911 and most fundamentally which one gets you excited. Probably most importantly is your budget for the initial purchase. For most of us there will be a finite amount that we can afford to spend on a 911. While many people think a Porsche 911 costs a fortune, in fact the opposite is true in many cases, especially if your considering at an older model. 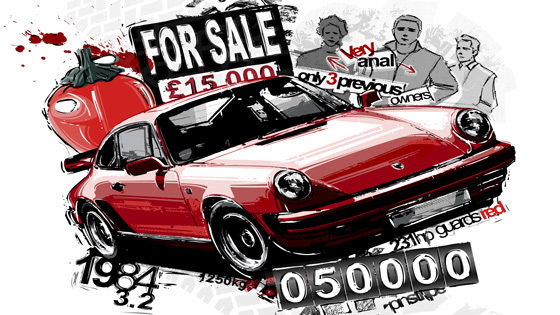 In many cases you can often sell your 911 again after a few years of ownership and perhaps get the same as you paid for it. This is especially true of some of the older "classic" 911's like the 2.7's, Carrera 3.0's 930's and the later 3.2 Carrera. Your might even turn a profit if you have taken good care of the 911 while you have owned it. Of course, you are buying a 911 to use. But how do you intend to use it. Is it going to be a track day weapon, a weekend warrior, an every day car or even a collectable. You might even be considering using your 911 for a few things. Drive it work during the week and take it on track at the weekend. Porsche built it's cars with this very prospect at the core of its design philosophy. Enjoy your Porsche on track at the weekend and then to work on Monday. You'll also need to consider if there are any particular models of 911 that gets your pulse racing. Is it the simple, purposeful, Spartan designs from the early years. Or is it the purposeful look of the wide body turbo variants like the 930 or Supersport? Technology, like ABS started to appear in the 964 models, while the 993 variant which followed started to introduce more aerodynamic lines to the body. The 996 offered a cleaner line to the body design, but for some the shared front end with the Boxter presented confusion. Then along came the 997 offering a combination of modern advances in automotive technology with a body styling harking back to the old days. The 997 Sport Classic even had a Duck Tail and retro looking wheels modelled of the famous Fuchs alloys of 911's up to 1989. Now the 991 has arrived. It's a bigger Porsche than previous 911's, but nimbleness has been maintained through a clever combination of composite materials and driver aids. If your mind is set on a modern version of the 911, but want the feel of the earlier more simple purposeful 911's then perhaps (if budget allows) you might like a 996 or 997 GT3 RS! The 911 has particular period of development from which you can choose. We hinted at them earlier in the article. The so called "early" 911's are those from the pre 1974 era. These 911's sleek and narrow bodied. The engines are smaller and technologically they are simpler. They are often referred to as the long nose or long hood. The bumpers are sleeker and less evident than those from later years. On the plus side these cars are pure classic and extremely distinctive 911's. Unfortunately they did not have the benefit of modern rust protection for bodywork, so it is almost impossible to find an original car without any rust. If your going early, either look for a well document restored example, or if the your budget allows and you are so inclined, you might take on a restoration project! Next came the so called impact bumper 911's. Denoted by their wider bodies, inflated bumpers and bigger engines, these 911's ruled the waves from 1974 to 1989 and are a popular choice for enthusiasts the world over. During the impact bumper years came the 2.7's and then the Carrera 3.0. The 911 SC followed and were produced en mass. These are far easier to find and are great 911's. More than 58,000 were produced during 1978 to 1983. The last of the 911's bearing the 911 type nomenclature, is the Porsche 911 3.2 Carrera. The later versions incorporated the G50 gearbox, considered by many to be the best, most robust gearbox of the early 911 era. The 3.2 Carrera's also have the benefit of being the first 911's to have engine management and therefore are great candidates for engine performance tuning. All the impact bumper 911's had full galvanised body protection. This slowed down the onset of rust. Don't be fooled though, these cars can be as rusty as any, so look before you buy. The Porsche 964, often called the first of the technology 911's came next. They are said to be unreliable, but I feel this is an underserved branding. The 964's are great 911's and there are many at what are true bargain prices. The air cooled engine was to come to an end. The last air cooled Porsche was the 993. These 911's were modern in appearance offering sleeker lines than the 964 and it's impact bumper 911's. 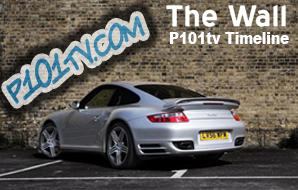 Slight larger and heavier to accommodate more gadgets and technology, these are very popular 911's. They very reliable and performance is in abundance. The popularity means prices are higher than the 964 and are holding their price despite availability of newer models. The 996 was design from the outset as a mass production 911. It shared parts with the Boxter and was bought by less discerning enthusiasts. These cars went too and from work and to the shops. They were not as popular amongst the Porsche die hard and as a result their prices have plummeted. There are some bargains around and you can purchase one for less than the price of a 993 and in some cases a 964. The turbo versions are a difference story. The Turbo's shared much with the 933 and seem to command more respect from Porsche enthusiasts. The price reflects this enthusiasm. The 997 served to re-invigorate the Porsche enthusiast. The 997 once again resembled Porsche past with distinctive Porsche looks wrapped over a modern chassis, engine, braking and suspension technology. With the release of the 991, the 997 prices have fallen, but are now steady. These are now a very affordable option. Hopefully this article has helped you in your research for deciding which 911 you'd like to own. Next, it would be eminently sensible to seek out a specialist to assist in the pre-purchase inspection. Money spent to help you assess the car in this way could potentially save you the disappointment and expense of discovering you bought a 911 that wasn't what it was purported to be. Once you have taken ownership of your 911 it needs to be taken care of. A well maintained 911 will not only reward you with a great driving experience, but it will also increase the likelihood of achieving a great resale price when the time comes to pass her on to her next owner. 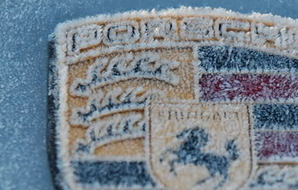 Many buyers will be seeking evidence of a Porsche that has been maintained by a reputable specialist, so do your homework in advance for both finding someone to care for your 911 at a price you can afford. We think it's better to talk and would love to hear your thoughts on this article topic. Simply scroll down to read what other Channel P101tv members are saying about this article. Why not add your say. Your comments belong here! You can scroll to the end of the page or Click here to add your comments now. Spot on Vaughn. It is absolutely about having fun, so interms of budget it should be about that - how much can I afford to spend, then look at what you can afford, taking into account what its costs to buy, restore (if needed) and run. I'd love to have a 911 ST, or a 1974 RSR or a 1973 911 S, but the budget downt always matc my bank balance! well.. which porsche should I buy ,I guess in hind sight I probably would have chosen a 1975 2.7 ltr porsche,but due to my lack of knowing little of porsche I eventually chose my carrera 3 (or whats left as a 3).but having said that I never bought it as an investment ,but as an old super car that I could afford.So to the question ,I'd say get one that suits your individal purpose and not one that will break the bank,after all its all about having fun isn't it ,in the long run. Add your say to this topic. Your comments belong here! 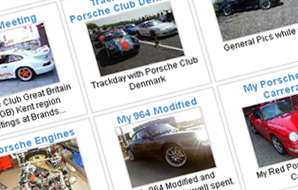 Our Porsche Articles and Guides archives are constantly growing. Take a look through the archives from the Articles menu or click on a preview from the carousel below. If you would like to join in, we would welcome your ideas for an artcle. If there's subject that you'd like to write about then get in touch and let us know. If the topic fits the reader's corner then we'd be pleased to publish it. 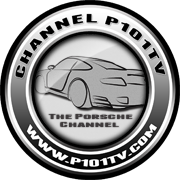 You will of course receive full credit for the article as well as a link back your Channel P101tv Profile. If there's something missing that you feel needs to be included or if something doesn't seem quite right, then please let us know. If you'd like to write an article for inclusion here then please get in touch. Just click on "Contact us" at the bottom of the page. We hope you enjoy the Reader's Corner of the Porsche Folio!